On sale from April priced from £72,155, the new seven-seater puts the focus on practicality and versatility while also bringing “unrivalled” luxury, like that seen in the 7 Series, to the large 4×4 segment. Optional features include massaging third-row seats, a glass roof with LED lighting to resemble stars, 16-speaker Harman Kardon surround sound system, and a heated or cooling centre console cupholder plus a dual 10.2-inch touchscreen entertainment display and Blu-ray-compatible DVD player package for the rear seats. In the UK, three versions are available from launch: a six-cylinder petrol engine for the BMW X7 xDrive40i and a pair of six-cylinder in-line diesels to power the BMW X7 xDrive30d and BMW X7 M50d M Performance models. The entry-level model is the 261bhp xDrive30d, which brings an official 43.5mpg and 171g/km (provisional) with a 0-62mph time of 7.0 seconds and a top speed of 141mph. 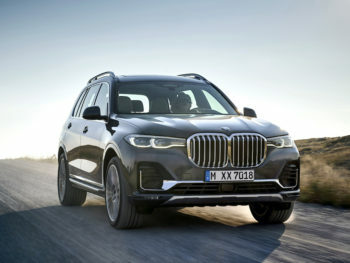 The X7 xDrive40i (priced from £74,155) offers 335bhp and a provisional 32.5mpg combined and 198g/km with a 0-62mph time of 6.1 seconds and a top speed of 152mph. At the top of the range is the £87,240 X7 M50d with 395bhp and 40.4mpg and 185g/km. It offers a 0-62mph time of 5.4 seconds and a top speed of 155mph.